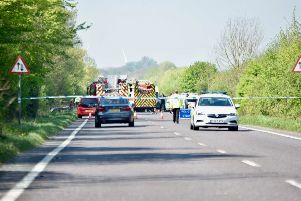 Emergency services have confirmed that seven people are now known to have died after a jet crashed on to a busy main road in Sussex on Saturday (August 22) but police fear more bodies may be found as the scene is cleared. The Hawker Hunter jet had just started its display at the RAFA Shoreham Airshow around 1.20pm when it failed to pull out of a dive and crashed into the A27 just north of the airport between Brighton and Worthing. Emergency services declared a major incident. All the fatalities occurred on the road and police say it is not believed that anyone who was actually on the airfield at the show was injured. The pilot of the jet was airlifted to the Royal Sussex County Hospital where he remained critically ill on Satruday night. Superintendent Jane Derrick from Sussex Police said: “We are continuing to search the area to ensure that we have identified all casualties. It is possible that there are still bodies at the scene and it is important that our search is professional and thorough. As I hope you will appreciate this is an intricate and difficult process and I am sure you will understand that the A27 will remain closed until this search and the investigation have concluded. This could be some considerable time and certainly well into Sunday and possibly beyond. “As a result, and as mark of respect to those who have died, the organisers have quite rightly decided that the show will not take place on Sunday. “I am aware that a lot of people have been very affected by the incident, not least those who wanted to leave, but were unable to do so immediately, particularly if they were driving. I am sorry if you were held up, but our priority was to deal with the injured and a secondary emergency access had to be put into place. “I would like to pay tribute to all of the staff of all of the emergency services and other agencies who are dealing with the incident and are hopefully bringing reassurance to those who have been caught up in the incident or who have family or friends involved. We are working closely with them and the organisers to deal with the incident and to understand exactly what happened. “If you are concerned about anyone who you think may have been in the area, please call Sussex Police on 01273 470101. Additionally, a family and friends reception centre has been set up at Worthing Hospital and support is also available at the Royal Sussex County Hospital. “However if you do contact us about a loved one who subsequently returns safe, please call us again to just to let us know.